The Gramophone Awards 2011: What Do You Think? : Deceptive Cadence These prestigious prizes were awarded today in London. Do you think the winners were the right picks? The Gramophone Awards 2011: What Do You Think? 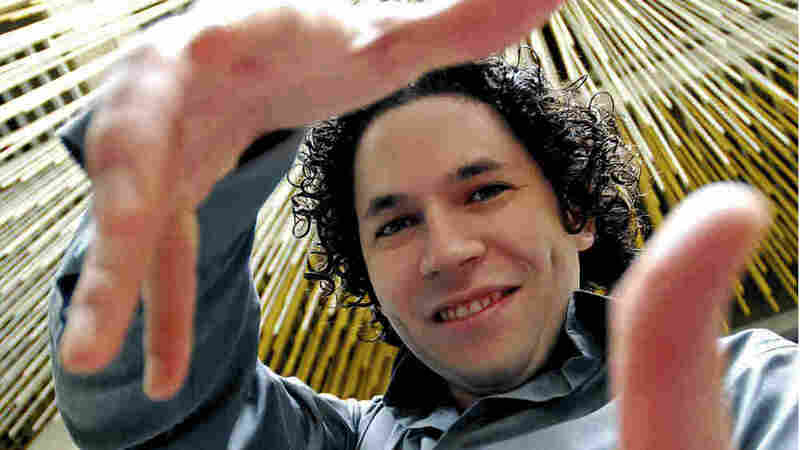 Los Angeles Philharmonic Music Director Gustavo Dudamel. The Gramophone Awards are a huge deal within classical music. (I feel confident in that assertion even while mentioning that I was the magazine's North America editor for several years during the past decade.) After all, we here in the U.S. don't have any American honors of equal prominence that are dedicated exclusively to classical music — and it's fair to say that as prestigious as winning a Grammy Award is, the classical categories don't exactly hold the television spotlight. They don't even rate a place on the Grammy broadcast! So these prizes, announced today for 2011 in London, have a special pride of place. Conductor Gustavo Dudamel accepts his 2011 Gramophone Artist of the Year Award. Some house favorites definitely emerged. The Pavel Haas Quartet was singled out twice over for their spirited performances of Dvorak string quartets, which won both Recording of the Year and the Chamber Music Award. (This continuity is strikingly different from the classical Grammy Awards of recent years past, in which the Best Classical Album prizewinner only occasionally overlaps with any other Grammy honor.) Italian-British conductor Antonio Pappano was part of three prize-winning recordings today as well: Editor's Choice, Recital and DVD Performance. This is the first year in which the Label of the Year Award has been given to an enterprise that specializes in live recordings. Keeping things local, it's London's own Wigmore Hall label, which has created some inspired offerings, including fabulous Beethoven sonata recordings with the still-under-heard violinist Alina Ibragimova and pianist Cédric Tiberghien. The Special Achievement Award went to conductor Sir John Eliot Gardiner for his astonishing Bach cantata "pilgrimage" on his own Soli Deo Gloria label — an effort that Gardiner started after his former label, Deutsche Grammophon, fizzled out on issuing their own Bach cantata series with him. The Lifetime Achievement Award went to another highly decorated artist within the Order of the British Empire: the mezzo Dame Janet Baker. In an essay for Gramophone, pianist Graham Johnson lauds her this way: "She was capable of thrilling people with her coloratura. It's a sheer gift. Nothing can make that particular color, that excitement in the voice which was able to so beautifully express wounded pride or a glowing conviction or anger." The hue of the Specialist Classical Chart Award has changed: Last year's recipient, the stadium-filling "waltz king" Andre Rieu, has given way to the very fine guitarist Milos Karadaglic, whom we here at NPR Music hosted for a Tiny Desk Concert earlier this year. The Montenegran artist also won the Young Artist of the Year Award. Milos performs a Tiny Desk Concert at the NPR Music offices. What do you think of this year's honorees? Any surprises? Did any particular favorites of yours win this year? Tell us in the comments section.